What applications are there for 3d printing? - making replacement parts for toys etc. I didn't get much of a break during the school holidays, so felt ill prepared to head back into school. I knew it would all be fine once I got back into things, and boy has it been fine. Our inquiry topic this term is 'leisure and entertainment', which is awesome. Its broad enough that you can take it where you/your class wants, and cool enough to keep the kids interested no matter where it goes. I was really excited about this topic. Why do we even have leisure time? Have we always had it? Does what we do for leisure activities change over time? What activities have endured throughout history, and why have they been so successful? How can society shape what is considered fun? 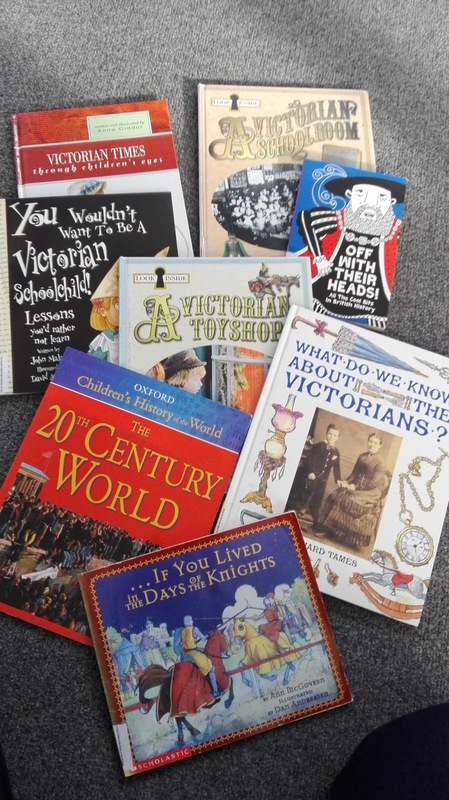 Hence, we launched our inquiry on Monday morning by reading a non-fiction text about the beginning of the 'entertainment industries' in the 20th century. The text itself was a little repetitive, but the kids didn't seem to notice or care. Even with this one reading, we began exploring what the word century means, what BC/AD are (and how time goes backwards, what?! ), the influence of laws on people and their work, how not having paid work leave affected people (i.e. they never took holidays because they couldn't afford it), what a normal 'working' week was considered to be and how this changed over time, when different entertainment tools (i.e. radio, TV, commercial flight for travel) were invented and how much they cost at the time and so much more. I mentioned off-hand to them that TV was in black and white in those days, and they were dumb-founded. So I showed them clips of the famous Charlie Chaplin and explained why they had no audio, that they were called Silent-films, etc etc. I was so surprised, as my little Maori and Pasifika children in the middle of Panmure were cracking up at Charlie Chaplin getting stuck in a lions cage. At this point, I was dumbfounded. The kids spent the next 20 minutes independently researching, watching and laughing at silent films. WHAT? They were so into the topic and it made my heart soar. If a non-fiction text about a law change in 1939 could bring about all that, this term is going to go well. 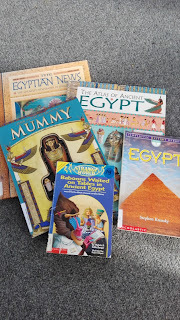 On Tuesday, I gave my kids a massive stack of non-fiction books I had gotten from our school library. 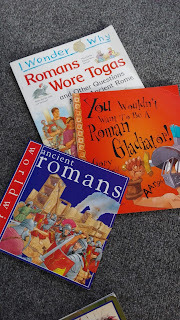 Now for context, my kids really struggle with non-fiction texts, especially the lower-ability ones. I chose actual physical books on purpose, as I wanted them to see that they aren't scary, that they can read them and learn from them. (The internet isn't the only way to research). My instruction to them was pretty much - pick a book, read it, find something interesting and record it on the brainstorm. (We had a brainstorm for each civilisation). One kid even said to me 'Miss this is so interesting can we keep doing this' as she left for morning tea. I almost cried. 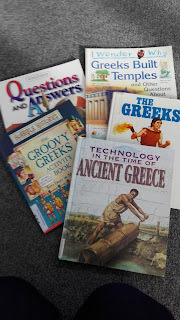 In the afternoon they chose a civilisation they were interested in, and began researching it in depth (and were allowed to use the internet if they wanted). Nobody fought. They were pretty even groups. I didn't have to force anyone to do Victorian England. They wanted to, they chose. That afternoon I had the BEST conversations with my kids. IT. WAS. THE. BEST. EVER. Today they continued working on their research. I noticed that throughout the hour, more and more of the library books got pulled out of the shelf and were being used to research from. It became a preference for them.. to read a real physical book, rather than use the internet. The rebirth of non-fiction books in my classroom. They even came and asked to read those instead of fiction for buddy reading time. I asked them today to go and comment on our class blog, but their comment had to be something they had learnt from that lesson. If you have a minute, read through the comments and see how much the kids learnt in a day. I am so happy with how the first few days of school have gone. 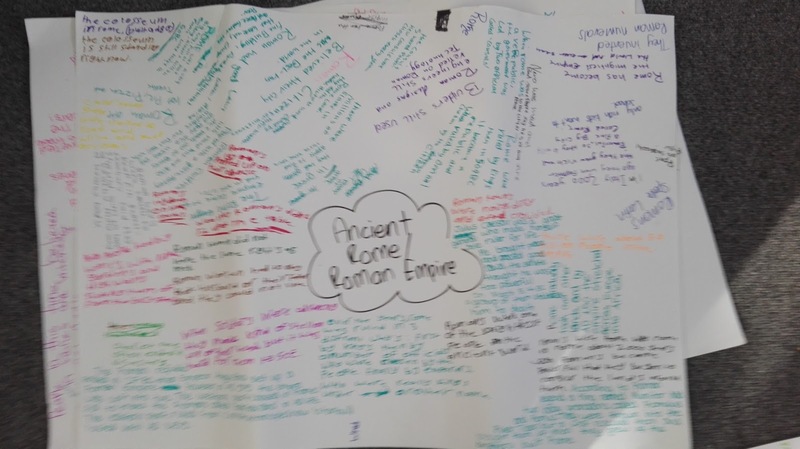 I feel that launching this inquiry has gone very well as the kids are so excited about their learning, asking quality questions and starting deep discussions. I recently read an article called Schools Let Students Take Laptops Home In Hopes Of Curbing 'Summer Slide' which was published in June 2017. This particular article is based in America, however discusses a global issue; the summer slide. In Manaiakalani schools, this is often called the 'summer drop off'. For non-teaching friends, this refers to the loss of learning children experience over summer when they are not attending school everyday. This caught my attention as in my recent data analysis, most of my students hadn't moved between Term 4 last year and Term 2 this year. In fact, they had fallen very far down, and I had spent two terms pulling them back to where they were. Good ole' summer slide. It's very difficult, and incredibly frustrating. "But, there is no research yet to show whether device distribution cuts back on summer slide, the learning losses most acutely experienced by lower income students during the summer when lessons from the school year are forgotten." My response: Well actually, there is some data. Manaiakalani has implemented a programme called the Summer Learning Journey which aims to reduce the summer slide/drop off by giving students learning to do over the summer break and encouraging them to blog about it as well. Their results are publicly available here. "I think we tend to have this idyllic view of what childhood summers are, but the reality is that for kids living in poverty, summer can be a time of isolation and hunger." "Parents in low-income neighbourhoods want to learn along with their children and are interested in being part of the digital age," she said. "Kids shouldn't just be given the equipment and told 'go.' They should be given content recommendations along with that. 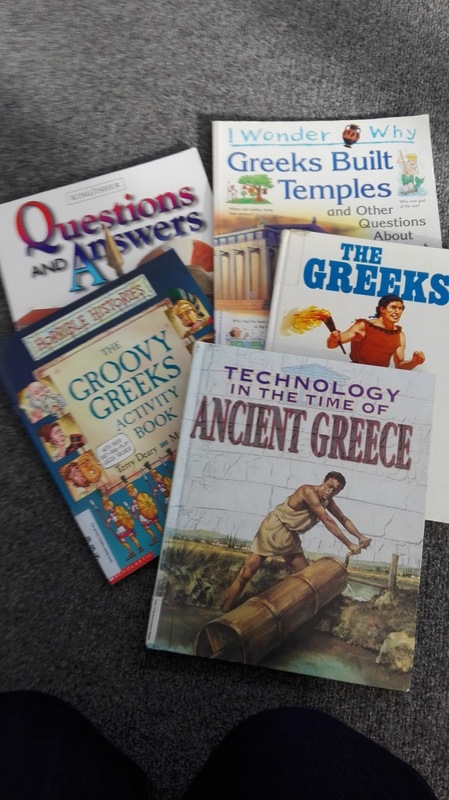 "Overall thoughts - I am excited to get discussions underway for how my school and I can make it work, so year 5/6 students have the opportunity to take their netbooks home and participate in the learning journeys. My principal has already brainstormed some ideas about how we can make this happen and I am so on board. My response: The first week back at school and the usual 'what did you do in the holidays?' is a very quick conversation in my class. A typical response is "nothing miss". Some students do not leave the neighbourhood, most do not leave East Auckland altogether. Parents are working, so often my students stay at home with an aunt, older sibling or grandparent. They report back on what movies they watched on TV and how they came to the school playground to play (our grounds are open). It makes me so sad. During the holidays, I often think of some of my students in particular (very few, but they are there) and genuinely wonder if they have been fed today, whose house they are at and if anybody is taking care of them. Poverty is hard. I often have students say they don't want to go on summer holidays because home is boring. School at least has friends, if not the learning bit. My response: Absolutely. When parents come in for Whanau Conferences, they want to know what they kids are doing online and learning to do. They want to be involved and learn alongside their child. That's one thing I like about the Summer Learning Journey, is that the parents can get involved and the tasks can be done together. I really want my students to get involved with the Summer Learning Journey this year, so next year their teacher doesn't spend half their year scraping back the learning they have already done. There is a Winter Learning Journey as well, for the Term 2/3 holidays. Currently, my students are not allowed to take their netbooks home as they are only year 5 and 6. 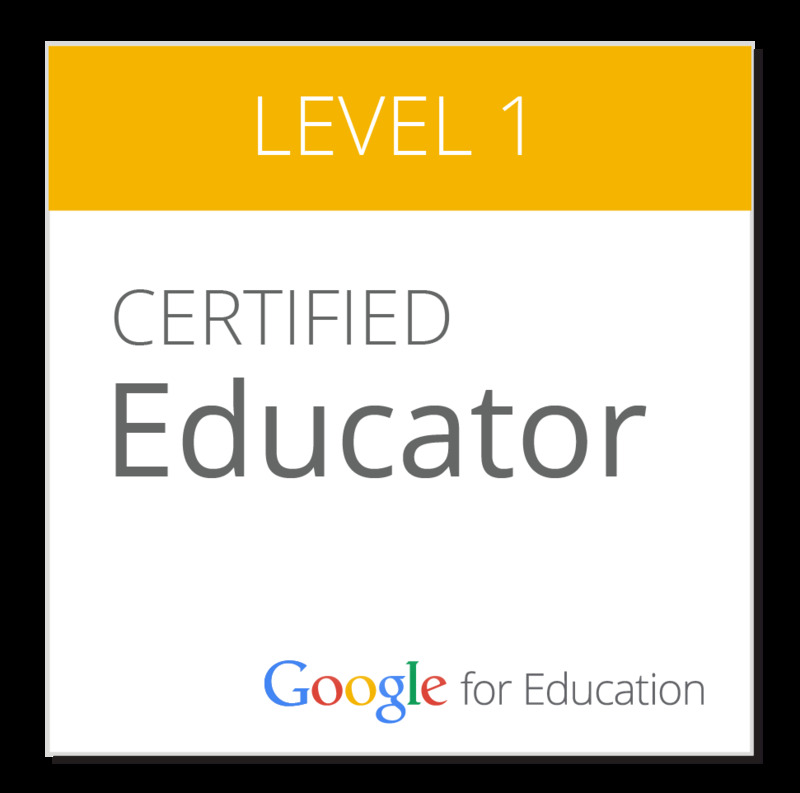 At the end of every term, I ask students to fill out a Google Form to help them (and me) reflect on the Term. I genuinely take their feedback into consideration and try to better myself as a teacher. Here are some gems/things to think about that I want to remember from this terms responses. Did you have fun this term? How? When? Yes I did. I had fun when we went to the tip top factory in week 7. I was able to spend time with my classmates and other students in other classes. I have had fun every time I come to school. i had fun when we were making sushi and it was fun because we were all doing something new because most of us have not made sushi before. What was one thing Miss Ashley was good at this term? Miss Ashley is good at including other people's ideas and their cultures. The most thing that miss ashley was so good was teaching us new strategies like algorithm and when coach us in our sport tournaments and how she encouraged us to never give us up. She was good at making everything fun because if we were stuck she would give us cool examples and she would always let us use a cool for writing like a debate. Miss Ashley was good at this term was maths. What was one thing Miss Ashley could be better at next term? She could be better at listening sometimes. What Miss Ashley can do better next term is to like make our work so challenging for us. 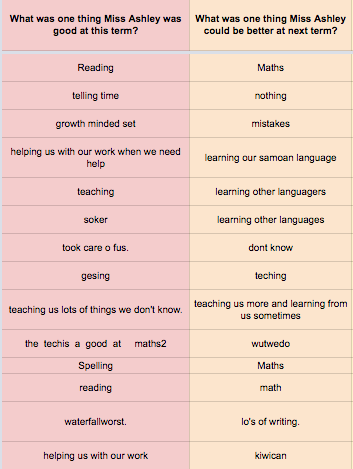 I also loved how many of my students were able to accurately say what they learnt in reading, writing and maths. A lot of our inquiry was mentioned as well (anything healthy/cooking/sushi related). I didn't prompt them at all to remember what they had learnt, so I was really proud they actually did remember by themselves. Hopefully that means it was absorbed deep down! I want to be respected, not feared, and so far this has worked for me. The one time students have taken their freedom to far, I addressed in (not even yelling!) and they stopped. I believe in being honest as possible and informing students as much as possible. Towards the end of the term I made a schedule to inform students of everything that was coming up (and to help me keep track!) and they LOVED IT. Definitely will be doing that again. I think next term I may have to be more strict on students who do not complete their work to the expected standard, and will talk to the students about this and we can agree on a consequence (etc) together. This is something I felt I was too easy on and they can't get in the habit of not finishing stuff before heading into senior primary. I want to do some kind of study on emotions/human nature to help my students better understand how each other are feeling and so they can empathise and help each other better. Needs to link to Mauri Ora Mana Potential Model.. I had a lot of fun this term. It was hard, stressful, something always happening (as usual) but it was great!